I bought this machine mostly for quilting as it is straight stitch only. I still love my Bernina 440, but I also wanted something faster with a larger harp space, without going more computerized than what I already have. In my mind, more computerized = more can go wrong and more money to fix…as I’m finding out right now with my 440 (another story for another post!). 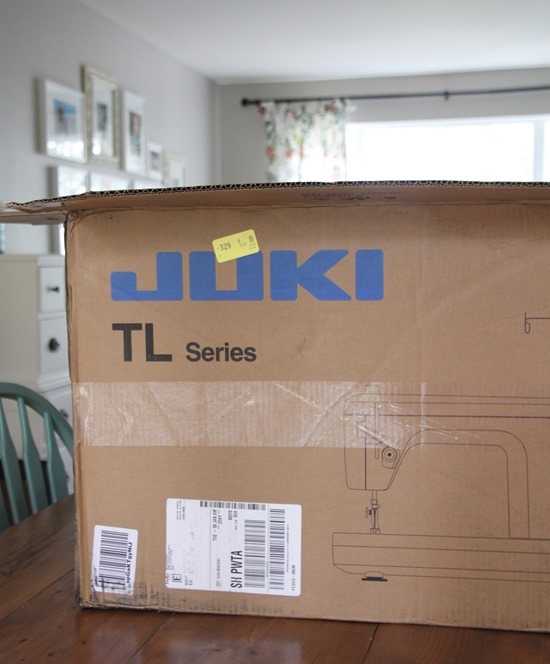 I noticed this is a popular machine amongst bloggers and youtubers…which means you can type Juki TL-2010Q into Google and there are hundreds of wonderful detailed reviews. I’ll share more of my thoughts about it and how it compares with the Bernina 440 in a future post. Did I mention it goes fast?! 1500 stitches per minute of pure awesomeness. 68 Responses to A Juki! I got one in October. I looooove mine. Enjoy!! I've had mine for 2 years this month and absolutely LOVE it! I agree that it's hard to find anyone who doesn't. Enjoy!! I love my Juki and my Bernina 440! Have fun. It is sew fast. I have one, and mostly love it. Happy to answer any questions you may have. I have had a Juki for a long long time – at least 12 years and I LOVE IT! It is my go to machine. I piece on it, I quilt on it. I still have a Janome for the fancy stitches but I will never be without a Juki! 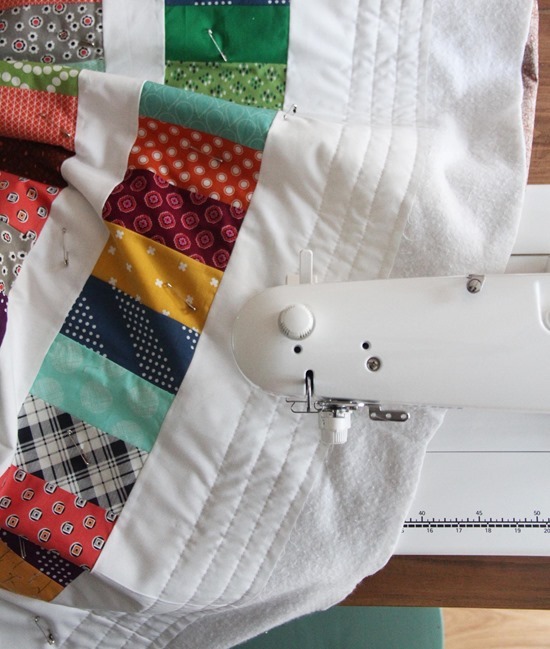 The speed, the knee lift, automatic thread cutter — so perfect for a quilter! Have fun! The fact that you got a Juki is ALMOST as good as the story about how you got it. Both are keepers! I bought this machine last weekend and am afraid to take it out of the box! I hope you will post more about it so I can learn! I got mine around Thanksgiving and have not looked back. I also have not stitched any of my fingers…those 1500 stitches can get away with you! Enjoy! Even thought I have the Janome 15000, which is quite a machine, I use my Juki more as it's so easy and is such a work horse! Plus, due to a recent illness, I had her brought down out of the work room so I could do some easy piecing. Well, something got out of whack and I was able to find the instructions via user groups to fix it myself! There's such satisfaction in being able to do that. I've had this machine since it came out (maybe 2 years ago) and it is the best purchase I've made! Enjoy! I love my Juki and I know you will love yours too! Probably a stupid question for experienced quilters, but can you drop the feed dogs, change the stitch length and free motion quilt on it? I bought the same one last month and I love it! I really love that I can cut the threads with the foot pedal. I haven't been able to figure out the automatic needle threader. Oh, I think you'll love it! I have a TL98-Q that I've been using for four years now – awesome machine, and I've been able to maintain it all by myself for the most part. A great workhorse!! I love my Juki too! She's my best friend ;) Enjoy, I'm sure you will! I hope you enjoy. I am a slow on piecing. I look forward to your reviews! I'm happy with my Bernina 780 right now. If you turn the machine side-ways, you don't have to fight with the small harp-space. It works wonderfully that way! What a wonderful gift and you will be able to turn out so much more of your great work. My Hubby bought me the Brother PQ1500S for Christmas,which is the exact same machine. I love mine! The harp space is awesome! This looks so good and efficient! My husband did the same after hearing me go on and on and bought me the Janome 1600P which is pretty much the same as the Juki but Janome is what is availiable in Australia. It doe s 1500 stitches and I love ! You are going to love quilting with a Straight Stitcher. Sounds like there are a few awesome Hubbies out there! I will have mine in about a month. Is there any difference in the 2010Q and the 2010 QI? I can't wait to hear how you like it. I just picked up a Juki TL 98 P from the shop this morning. It's sitting looking at me waiting to be unpacked but I ought to get on with some jobs around the house first. My husband got me the Bother PQ1500S for Christmas which is very similar and I love it! I felt the same way about having a less computerized machine and have been so happy with how it stitches! I hope you enjoy your new machine as much as I am!! I LOVE to sew fast! I have that Juki too at home. It's right in front of a double window so I can see the birds while I sew! At our shop, I have a Jane which is much like the Juki so I can sew FAST in TWO places! Enjoy your new toy! Congrats on having such an attentive hobby and on your new machine! I have a Bernina 1530, the first, I believe, of the computerized machines. She'll be 21 years old in March and I have had one problem with it! I wore out the little piece where the walking foot arm attaches. Well I will have to try talking more (less subtle) about it. I don't think I can since I have a Bernina that I bought a few years ago that cost way too much for what it can do. I played on a Juki that a friend has and it was so wonderful so have fun. 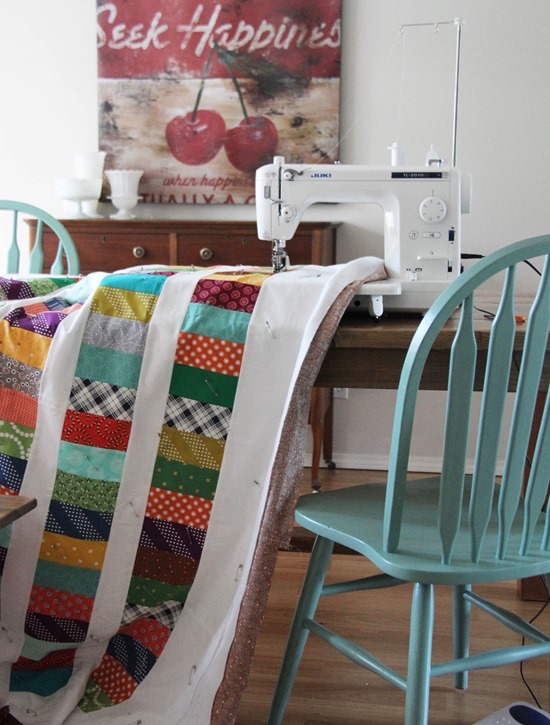 I am getting one in a couple weeks—I am getting it to learn free motion quilting….will someone write on how they like doing quilting on it and any tips???? 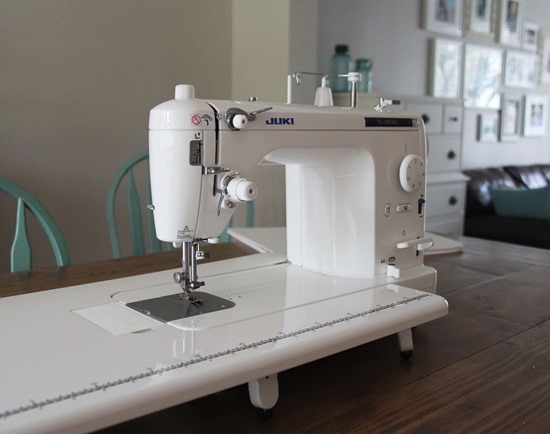 Hi, I bought a Juki Exceed F-600 in Dec. 2014 after read some good reviews, so far I'm liking it but haven't try the FMQ yet, if anyone have the same model and have done the free motion quilting, would you please let me know of your experience? I also have Janome Horizon 7700 QCP, I have some trouble to figure out the proper tension on FMQ then the circuit board just quit on me, luckly it is still under the warranty and now is all good. What is your experience with Janome 7700? Thank you for your input. Oh, what a happy day for you! I am looking forward to hearing what you love about it, and seeing what you make!! By the way, the quilt on the machine is gorgeous! You are going to love your Juki! I've had mine almost 2 years and keep my 440 packed up for retreats now. I very rarely need the Bernina set up unless I am doing machine applique (pretty much never). My favorite thing aside from the fast stitching, is the foot pedal thread cutter. You've got 2 keepers…husband and Juki! Very nice and always a blessing when our hubbies do something so amazing! Cuteness! I love a good little mechanical machine that only knows straight stitch! Congrats! I have a JUKI and a Bernina 780 and my JUKI is my go to machine. You will love it. Most valuable feature of late is the presser foot tension which produce perfect seams. What a wonderful gift. I can't wait to hear how you like it. I have been kind of nagging my hubby that I want one too. What a dandy hubs! I'm looking forward to reading the comparison between the Juki & 440….I'm not entirely smitten with my 440 and find it's a love-hate relationship, with harp space always being an issue. Cheers & enjoy your new toy! I'm so happy for you, what a sweet husband! I'd love one too (and the husband that buys lovely gifts…) but I'm a bit scared that 1500 stitches a minute would mean I'd just screw up even faster! Awesome surprise!! YAY! Happy for you! I got a Juki three years ago and I love it! It has not missed a beat. I have mine on a Grace frame and I love that I can finish all of my own quilts!! Oooh! How exciting! What a great surprise gift! I love my Juki! Best Christmas present ever! Oh what a great gift! I bought mine last May and love sewing on it. Happy quilting! What a blessing your husband is! The advise the Juki people gave is holds true for any item you purchase – check out any item you purchase immediately after bringing it home. Rachel at Stitched in Color has one and loves it–but I do remember she had problems with it in the early stages. But two days–how disappointing. My Juki TL98E works great until I need to change the bobbin. Then it's half an hour or more of fiddling with the tension to get it going again. It was left to me by a friend who passed away from breast cancer. It was very kind of her indeed. However, as I am not the original owner I don't think there's much I can do. I called the nearest place that sells them and they're telling me it's me and not the machine because when I do get it going it works perfectly… until the next bobbin change. I do love how fast it is though! Did yours come with a detailed manual? Mine just has a thin little manual. Or a website that one can go to for help? Congratulations on a great machine! Last summer I bought myself the TL 2000Qi. I love love love it! In fact, I use it for piecing, too, instead of my computerized Viking. In fact, the only reason I'm keeping my Viking right now is for when I need to hem or repair knits (for the zig-zag stitch) or for mending, sewing on buttons, etc. After seeing your post and another blogger recommend this machine my husband ordered it for me today for valentines. Looking forward to hearing how you love it! That is a beautiful machine Allison! I sure hope the replacement gave you no troubles at all.